Approximately one per cent of the world population live with rheumatoid arthritis (RA), with at least twice as many women affected as men. RA is a leading cause of disability. However, the current pattern of health care delivery to those living with RA is not prepared to deal with the economic burden of the disease that is expected to double within the next 30 years, while the number of rheumatologists (arthritis specialists) is already too few to provide timely care. 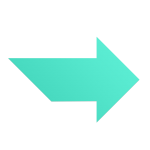 The RA Models of Care Pathway Toolkit (the "Toolkit") has been prepared by the Global RA Network in response to healthcare system gaps and to improve the way care is delivered to RA patients. The Toolkit is a comprehensive depiction of a patient's journey through the health care system, along with a list of helpful information for each step along the way. This can be found on the Global RA Network website (http://globalranetwork.org) and is updated regularly. All resources identified by the Globa RA Network in the Toolkit are drawn largely from information and guidelines for patients from the patient organization of the European League Against Rheumatoid Diseases (PARE), European Medical Agency (EMA), European Commission (EC), American College of Rheumatology (ACR) and from patient group members of the Global RA Network. PARE, ACR and the EMA provide lay definitions and short research summaries for patients of selected key research studies as well as any implications for treatment of the specific type of arthritis. The summaries are written in plain language in a consistently structured format and checked for accuracy and readability. The Toolkit is organized by the order of the RA Models of Care Pathway, boxes 1 through 14, with a resource link for each tool. Patients can click a specific box (e.g. box 5 "Consultation with Rheumatologist") and view a complete list of resource links related to that section, as shown in Figure 2. 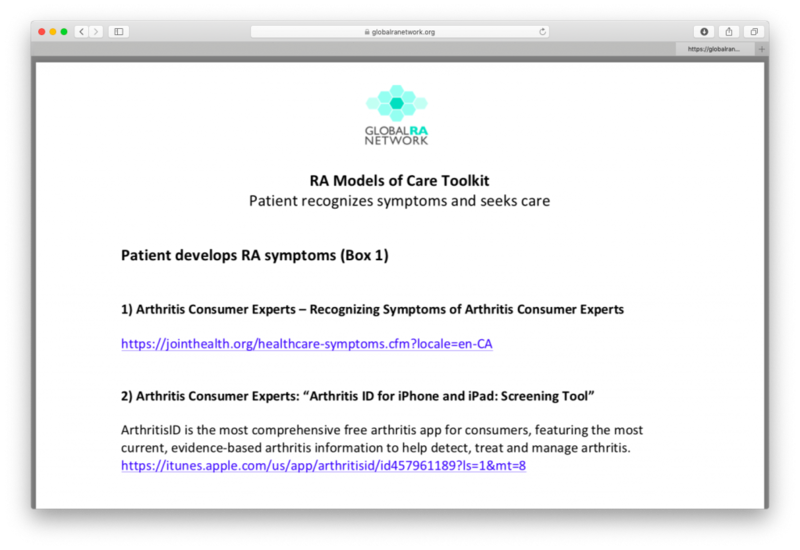 The Global RA Network regularly updates this online Toolkit for patients. Please contact Kelly Lendvoy at lendvoy@jointhealth.org if you would like to add to the Toolkit. Founded in 2016 by rheumatoid arthritis (RA) patient organizations and leaders from 18 countries, the Global RA Network (the “Network”) serves RA patients around the world, providing research-based education, information and advocacy leadership to overcome barriers to an optimal RA model of care and raise awareness of common goals for appropriate care in their country. Arthritis Consumer Experts (Canada) serves as the Network’s secretariat. The Network’s website is an on-line meeting ground and a place to share its ongoing work and educational and informational resources with RA patients, care providers and governments. The Network’s first initiative was to conduct a survey on patient experiences of RA Models of Care. What are RA Models of Care? Rheumatoid arthritis (RA) Models of Care outline the way health care services are organized and delivered for people who think they have RA and those who go on to be diagnosed. For patients with a chronic disease such as RA, the model of care needs to ensure access to care is ongoing, where, when and how people need it. Key elements of RA Models of Care must address the complex, life-long issues facing patients and include all points of contact across the health care system. Access to specialist care – Early identification, assessment and referral to appropriate specialists are essential steps in proper RA management. Medical management – The management of RA is complex and requires constant monitoring with a specialist to ensure effectiveness. Shared care – Treatment decisions must be made through agreement between the patient and the health care team, and there must be adherence to the treatment regime, including appropriate lifestyle changes. RA patient self-care – The patient must be fully educated about their medical conditions and the importance of adherence to the treatment regime. 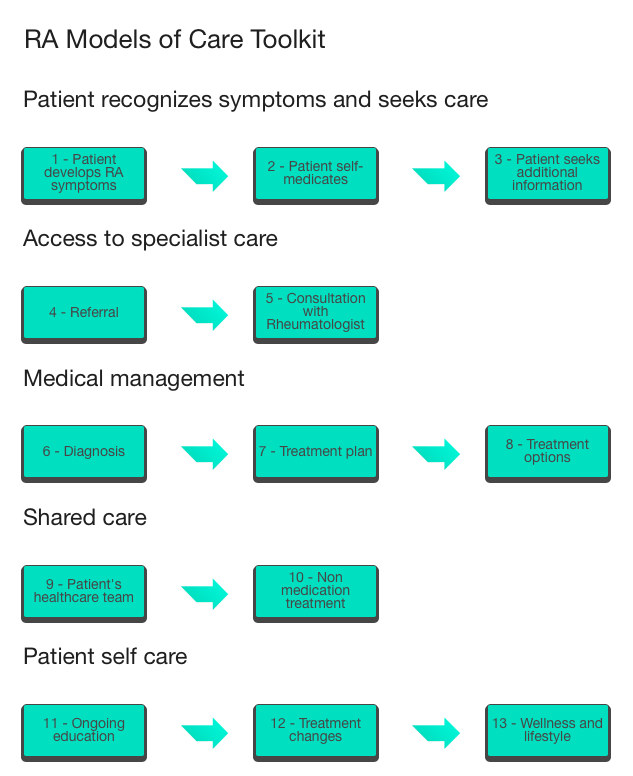 A healthcare system that meets all five elements will create a pathway of care, from prevention, diagnosis, treatment and self-care, to ensure the RA patient has access to the right care provider, at the right time in the care path. The Global RA Network conducted an international survey to learn about patient-reported experiences of rheumatoid arthritis models of care. The survey - “Patient Experiences of Rheumatoid Arthritis Models of Care: An International Survey”1 - highlights self-reported gaps and delays in all five key elements of a standardized RA model of care, including significant delays to diagnosis and specialist access in the countries surveyed, patients not meeting their arthritis specialist often enough, and the need for education/information to increase patients’ confidence to describe RA and improve their ability to care for themselves. On average, RA patients surveyed waited nearly two years (22 months) for an accurate diagnosis, representing a significant delay in starting treatment for these patients. This is despite the fact that current guidelines state that anyone presenting arthritis symptoms should be referred to, and seen by, a rheumatologist within six weeks. In RA, the immune system attacks the cells that line the joints, causing them to become chronically inflamed, painful and swollen. Timely diagnosis, treatment and on-going management by a rheumatologist is needed to optimise treatment, manage flare-ups and limit long-term joint damage so that people with RA can maintain their quality of life and stay active and in work. Survey results revealed that 51% had to wait longer than three months for their first rheumatologist appointment and 33% of patients did not see their rheumatologist as frequently as recommended by guidelines. The survey also revealed gaps in patient awareness of disease and treatment. 49% of those surveyed did not know if they were taking a biologic treatment and 39% said they did not feel confident describing RA. Evidence shows that a better understanding of RA and treatment options can help patients to interact with rheumatologists more effectively and ultimately improve disease management. © 2019 Global RA Network All Rights Reserved.